Wondering if there’s a way to make healthy gravy? Yes, there is!! I’ll tell you everything you need to know about the ingredients and the process for how to make the best gravy. This homemade turkey gravy is so delicious, easy to make, and is one of my favorite parts of Thanksgiving dinner. Every year, my favorite part of my Thanksgiving meal is the cranberries. It’s my usual. Well, a few years back, things changed. I went out on a limb and changed up my “usual” gravy recipe. I know: Watch out. Lacey’s getting adventurous. I have always made turkey gravy from scratch by just adding some flour and chicken broth to the turkey drippings. For some reason, I never considered adding in even more flavors, like onion and garlic. This change was a total success. Love when that happens! Oh my goodness. 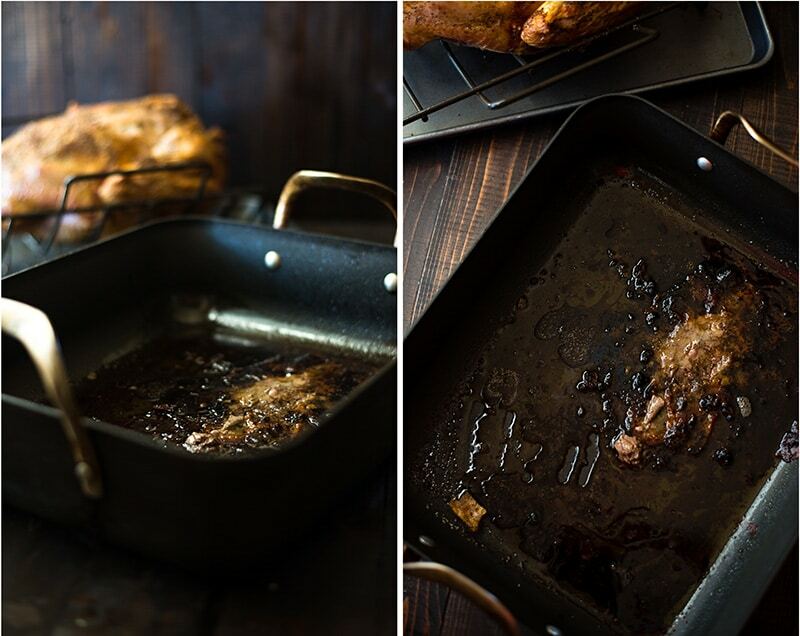 I absolutely swoon for this homemade gravy. It’s super easy to make and takes the perfect amount of time while you’re waiting for the turkey to rest. Also, we’re talking about healthy gravy here. Did I actually manage to make healthy gravy? YES, I did. Now you get why I’m so excited about this easy turkey gravy, right? I like to drizzle some (probably way too much from any objective observer’s perspective) over my stuffing, turkey, and mashed potatoes. Okay… and on my green beans too. 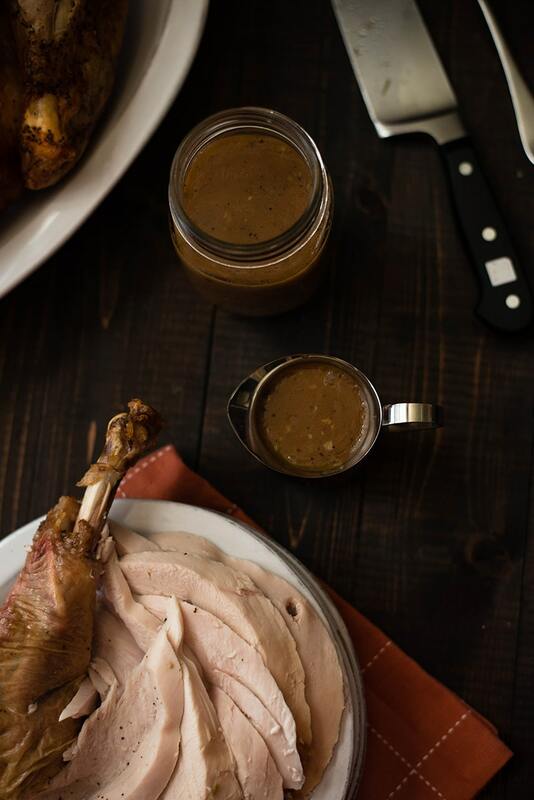 Try this turkey gravy recipe and you’ll understand. It’s that good, people. Gravy is delicious. That’s a fact. A positive fact. But is gravy healthy? I hate to break it to you but no, not usually. I know, I know. 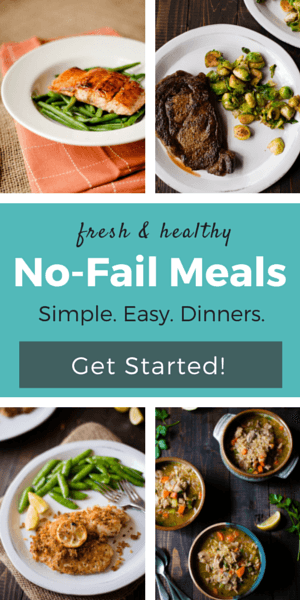 Don’t worry, I’ll teach you how to make homemade gravy healthy but first, let’s see why gravy isn’t healthy in the first place to see what we have to change in the traditional recipe. Deal? Let’s start with the most obvious problem. Gravy is made with fat drippings. I don’t think I have to tell you that consuming foods that contain a lot of fat is not good for you. Traditionally, gravy is thickened with roux, a mix of flour and fat (more about it later), or cornstarch. 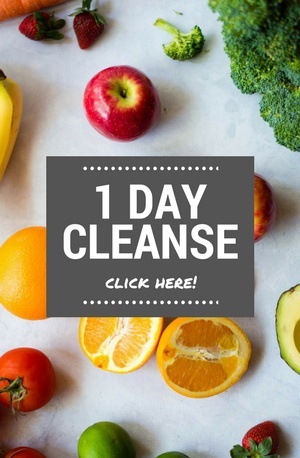 A mix of carbs and fat? That doesn’t sound very good. Am I right? You can also make or buy creamy gravy. Creamy gravy is made with full-fat milk, cheese or sour cream. 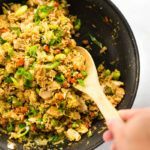 The texture is rich but the calories count sky-rockets when adding more fat to something that already has a high-fat content. Packaged gravies contain a ton of salt, which automatically means a ton of sodium. Even homemade gravy can contain too much sodium. Darn it. There are people who prefer a gravy that is slightly sweeter than traditional gravy. You know what that usually means? Refined white sugar. If you learn how to make turkey gravy, you might be able to fix some (if not all) of the problems I just listed. 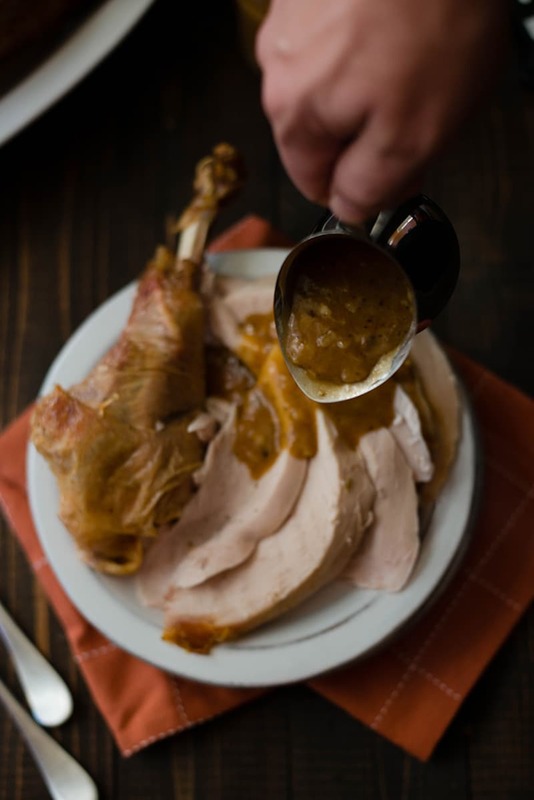 To reduce the fat content of gravy, use more chicken stock and lower the quantity of turkey drippings. In fact, you can entirely replace the turkey drippings with chicken stock. If you make turkey gravy from scratch, you can make the roux healthy. Or at least healthier. I’ll show you how to make a roux in a bit. And yes, it’s a healthy version of roux. It’s easy, actually. 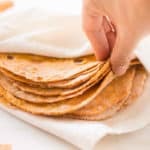 All you have to do is to replace the butter or vegetable oil with olive oil and the all-purpose flour with whole wheat flour or gluten-free flour alternatives. Options are coming your way in a bit. Do you prefer creamy gravy? Well, in that case, opt for skimmed milk and stay away from full-fat milk or cheese. To reduce the sodium content, use low-sodium chicken stock and add flavor to your homemade gravy by adding vegetables and herbs instead of salt. I like to use garlic and onion but you can add celery, parsley, oregano and so on. Those who prefer sweet gravy should skip the sugar and add cinnamon, ginger, vanilla, nutmeg, and even applesauce. So far so good, right? It’s not hard to transform traditional gravy into healthy gravy. Am I right? Transfer the mixture to a blender and blend until the gravy is smooth. It’s time to discuss roux now. Roux is a mix of equal parts of fat and flour. The mixture is cooked together and used to thicken gravy. Or béchamel. Or other types of sauce. The fat in the roux can be any type of fat. 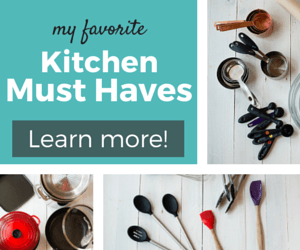 Butter, vegetable oil, or even pan drippings or bacon. I opted for olive oil because this a healthy oil. As for the flour, you can replace all-purpose flour with chickpea flour like I did or choose another option from the list I made for you. You can add vegetables and herbs to the roux. I added onion and garlic. Plus a little bit of salt and pepper. When it’s done the roux smells a little bit nutty and looks amazing. Chickpea flour replaces all-purpose flour nicely and it’s what I regularly use to make this easy turkey gravy. Chickpea flour is high in fiber and folate, it contains minerals (calcium and magnesium), and vitamins, particularly B vitamins. 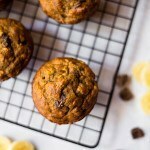 Coconut flour is another great replacement for all-purpose flour or whole wheat flour. This flour is high in fiber and it contains healthy fats as well. 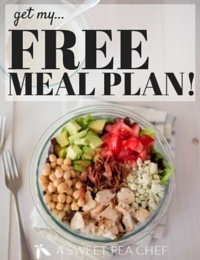 Plus, it’s low-carb and carries a low glycemic index. Almond flour and buckwheat flour are other gluten-free flour alternatives you can use to make turkey gravy from scratch. Almond flour is packed with minerals (magnesium, manganese, potassium, calcium, and copper) and it contains healthy fats and a high amount of fiber. Buckwheat flour is the last gluten-free flour alternative but not the least. By any means, not the least. This gluten-free flour is high in antioxidants and nutrients. Buckwheat flour contains minerals (magnesium, folate, zinc, and iron) and B vitamins. I showed you how to make a roux but I also mentioned that homemade gravy can be thickened with cornstarch. Which is true. However, I wouldn’t recommend it. First of all, the nutty flavor of roux is definitely better and roux gives you the opaque and thick gravy we all love. Second of all, if you’re not careful with cornstarch, you can end up with a gel-like gravy. And cornstarch is a highly processed starch so you don’t get any nutritional benefits if you use it in your homemade gravy. So, how to thicken gravy? With healthy roux. This is the short answer. You can make more roux and store it separately and add more in the gravy until you reach the desired consistency. Reduce the heat and allow the gravy to simmer for a few more minutes if it did not reach your desired consistency in the recommended time. Use arrowroot starch, half a teaspoon at a time, like you would cornstarch. Arrowroot starch is a less refined option for thickening. And remember, it’s easier to thin a thick gravy than it is to thicken a way too thin gravy so don’t be afraid you’ll ruin the gravy with too much roux. I get this question a lot during this time of the year. 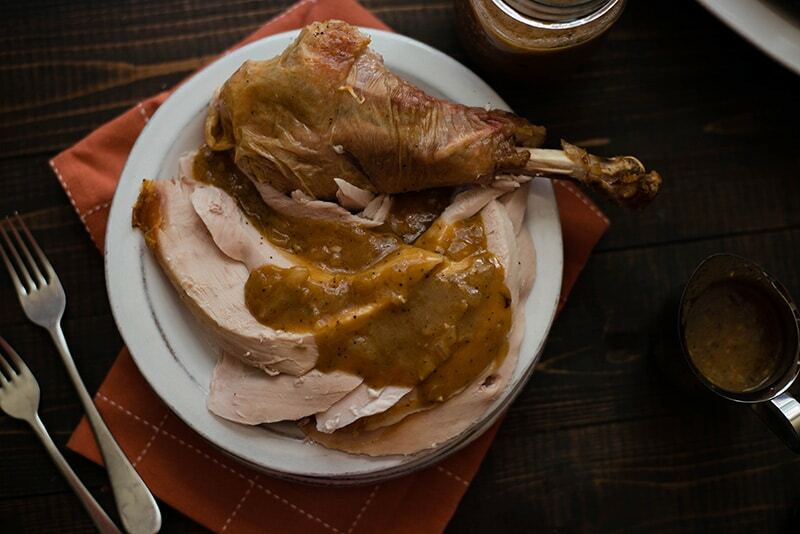 The answer is – YES, you can freeze turkey gravy. I’m talking about my chickpea flour-based gravy recipe. However, not all gravy recipes freeze well. 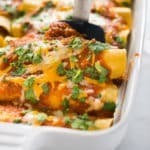 Creamy gravies aka milk-based gravies don’t freeze well because they separate during the thawing process. Store the homemade gravy in the freezer for up to 4 months. I hope I made this turkey gravy recipe easy for you. I also hope that all my tips and recommendations will help you to make a healthy gravy you can enjoy guilt-free during Thanksgiving. 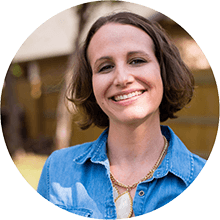 And it’s time for 3 more easy, healthy, and delicious Thanksgiving recipes I want to talk to you about. 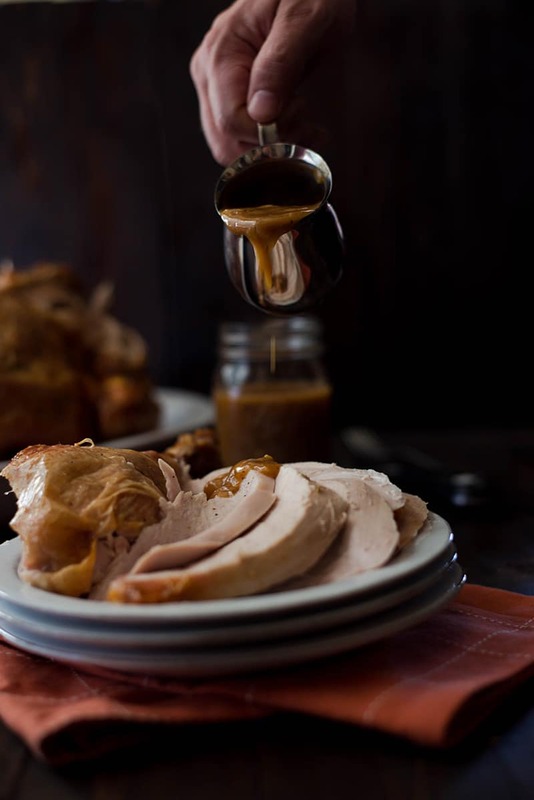 Now that you know how to make gravy from turkey drippings, it’s time to talk about the turkey. I have a No-Fail Thanksgiving Turkey Recipe and I can guarantee that your Thanksgiving turkey will be amazing. 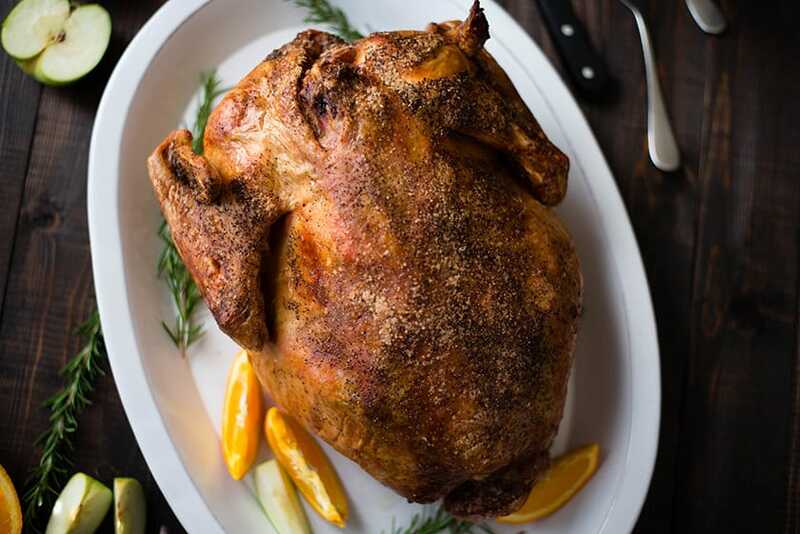 People are intimidated by the Thanksgiving turkey but roasting is probably the easiest method of cooking so you’ve got nothing to worry about. 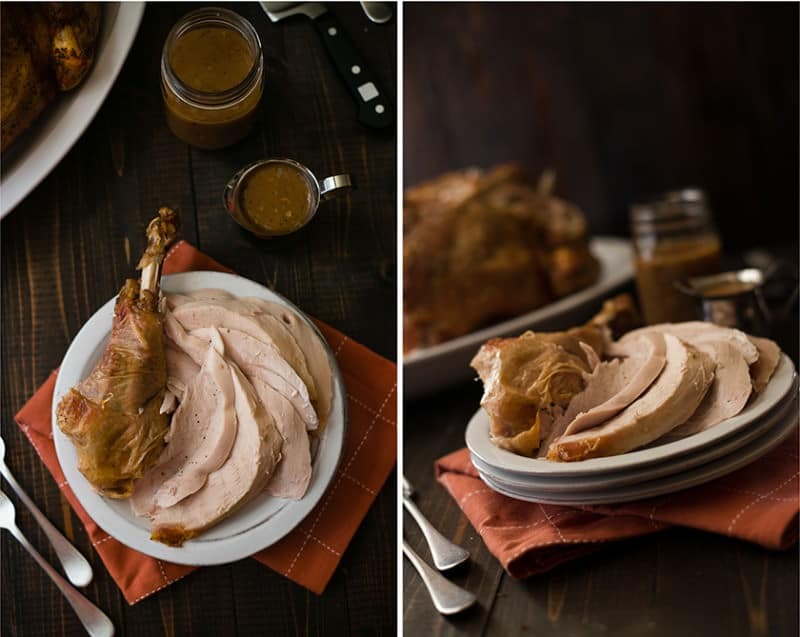 Plus I’ll give you all the tips you need to make a delicious, tender, and flavorful turkey. Get the recipe. 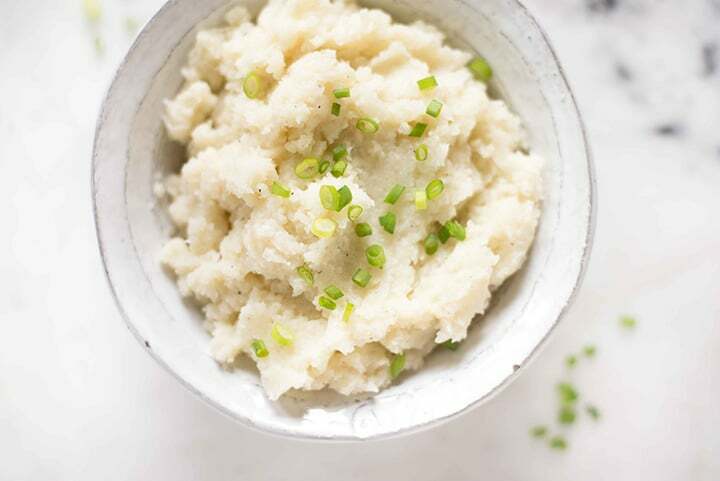 Cauliflower Mashed Potatoes – a low-carb and healthy alternative to mashed potatoes that can be made vegan. I didn’t jump on the cauliflower mashed potatoes bandwagon from the very beginning because I love my mashed potatoes a lot. But, once I tried the cauliflower mash, I fell in love with its texture and taste. Get the recipe. 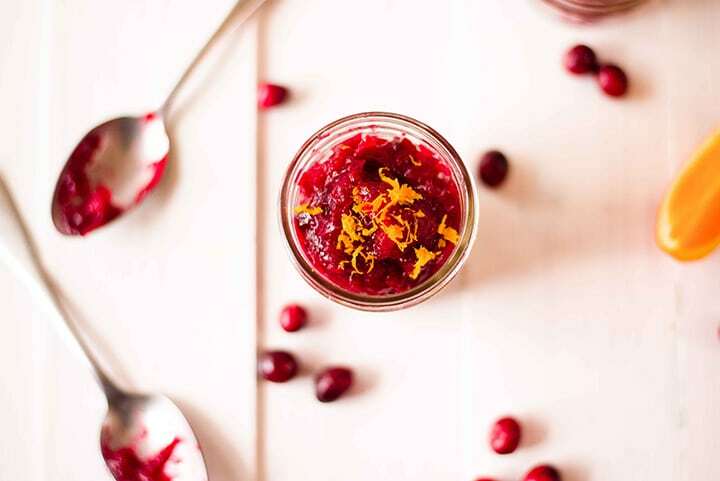 Another thing I look forward to – the Best Homemade Cranberry Sauce. Seriously, I love cranberry sauce and making it at home makes a whole lot of difference. Canned cranberry sauce can’t be compared to homemade cranberry sauce. And you only need 4 ingredients to make it. Plus it’s super easy. Get the recipe. Heat olive oil over medium-high heat in a skillet or sauce pan. Add onion and garlic and sauté until very tender and almost golden, about 6-8 minutes. Add the chickpea flour, sea salt, and pepper, and stir to combine. Cook for 2 minutes, stirring frequently. Add the turkey drippings and broth. If there are not enough turkey drippings to make a full 1 cup, add additional chicken broth. Stir to combine. Cook until mixture has thickened, about 8-10 minutes. Lacey that gravy looks delicious. This year I had so much “drippings” from my turkey that I was able to make the gravy without adding any more liquid, but usually I add potato water if needed. Cooking the turkey and all the trimmings made me realize that my vegan diet leaves much to pine for! I roasted the turkey “breast side down” for the first time, and it left the breast really moist. And yes, I did taste. Naughty me, but hey, “a foolish consistency is the hobgoblin of little minds”. Your presentation is so lovely. Hi Miss Becky! I won’t tell anyone you sampled the turkey…that secret is safe with me :). I’m so glad cooking the turkey breast-side down worked out well for you. I love that trick. Hope you had a wonderful holiday.